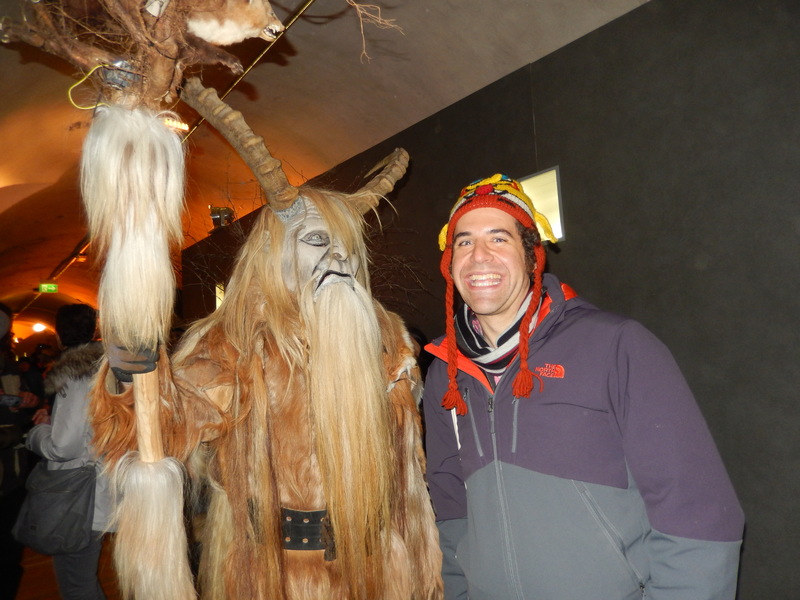 Early last month, Doer and I crossed a big item off our bucket list when we visited Austria in hopes of experiencing a Krampuslauf, or Krampus Run. I don’t know how exactly our weird obsession began, but it has only grown throughout our years together. We both enjoyed watching Austrian actor Christoph Waltz (Inglourious Basterds, Django Unchained) explain the concept to Jimmy Fallon recently. 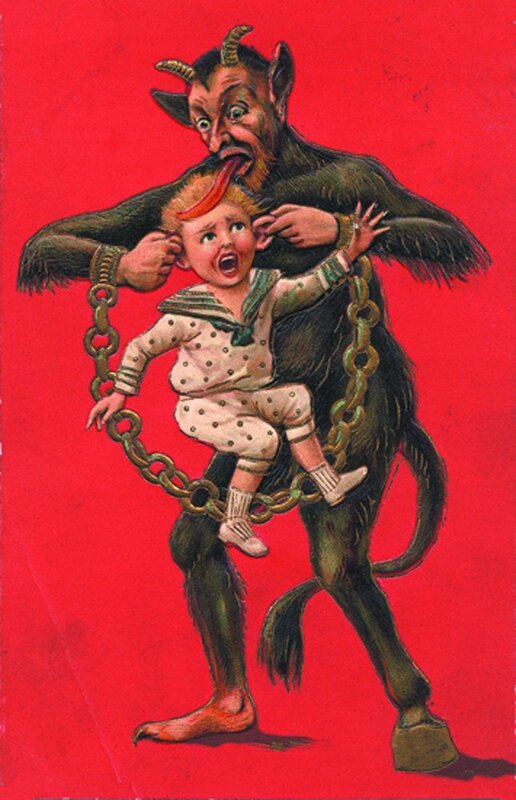 Instead of Christmas cards, Doer and I tend to give one another Krampuskarten like the one up above – check out Pinterest for more examples (some are NSFW). 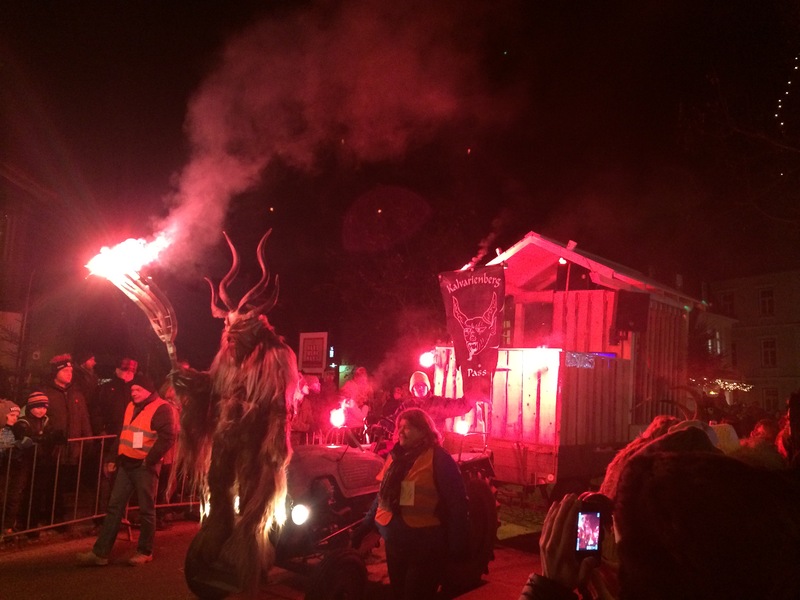 Thus, we were thrilled to experience two Krampus events – beginning in Vienna, which served as training wheels for the second, more intense spectacle in the small mountain town of Bad Goisern. Would you look at that switch? Bad Goisern. Krampus runs traditionally occur in Alpine villages, and not just in Austria – towns in Bavaria, Croatia, Czech Republic, Hungary, Italy, and Slovenia also participate in the fun/terror. The events tend to coincide with Saint Nicholas’ Day, around December 5 or 6. Though the creature is now linked to Saint Nick, its history dates back to pre-Christian pagan rituals. The name derives from krampen, meaning “claw,” and Christian groups have attempted to banish Krampus runs at different times because of the creature’s resemblance to Satan. 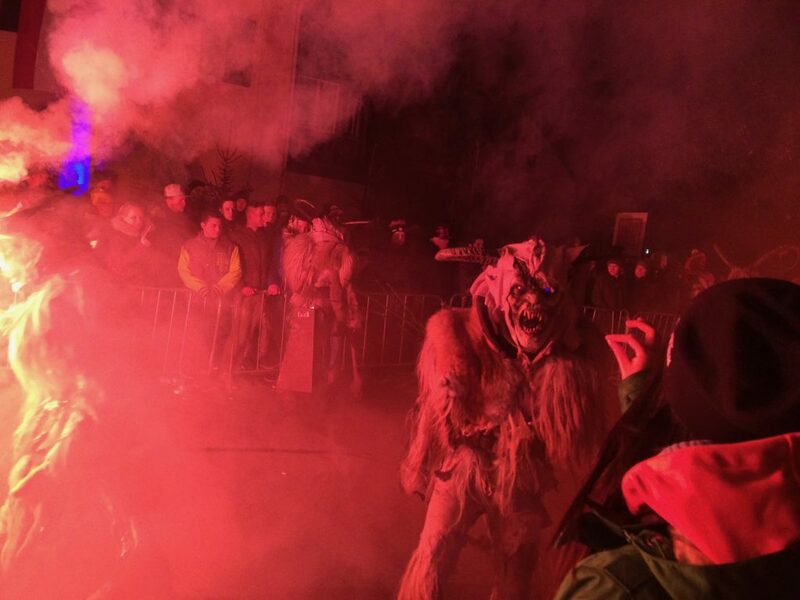 While the saintly Santa figure puts candy into the shoes of good boys and girls, Krampus either beats bad children with birch branches or stuffs them into his bag, dragging them away to be eaten or tortured. 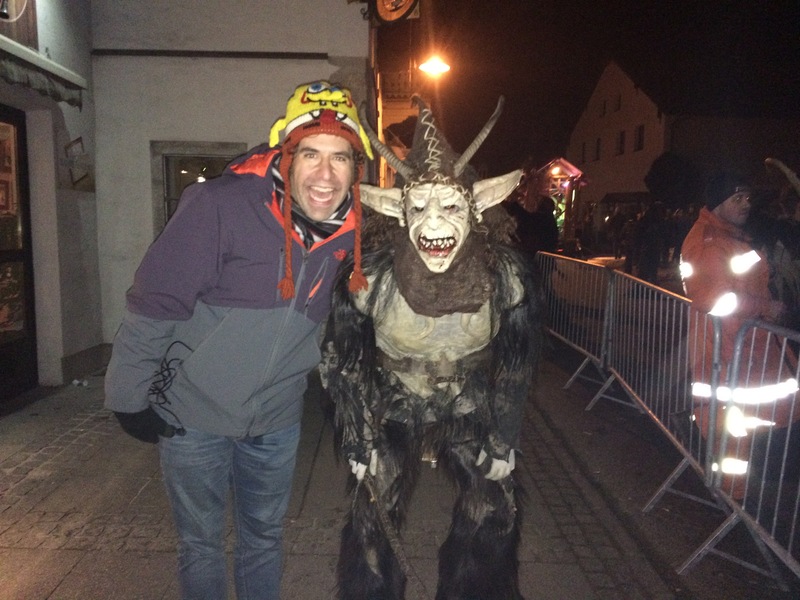 In both of the runs we witnessed, St. Nick and people dressed like angels handed out candy to children before the Krampus figures emerged, clanking cowbells, to beat people with switches and steal their hats (mine was stolen twice in Bad Goisern – luckily I got it back). After their Krampus shift in Bad Goisern. 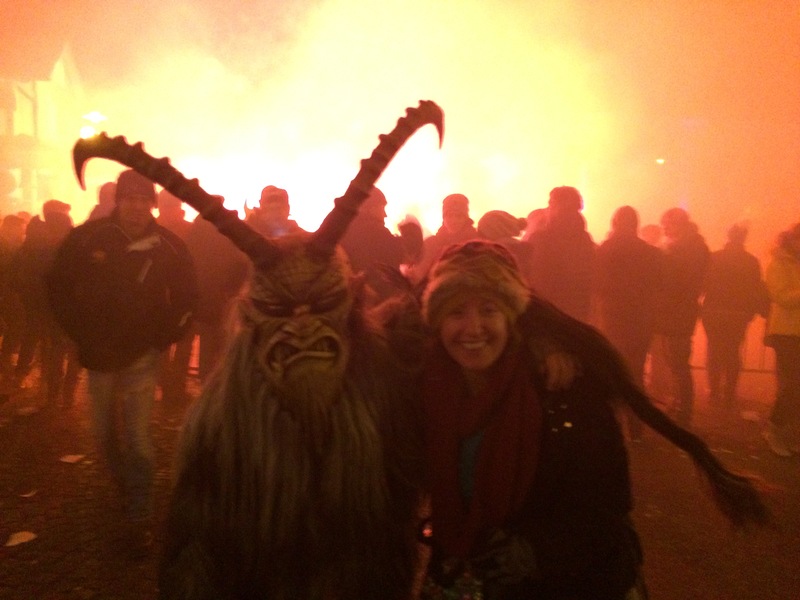 An Austrian friend from my Spanish class told me he was frightened of Krampus when he was a child, and after our experience, I understand completely. 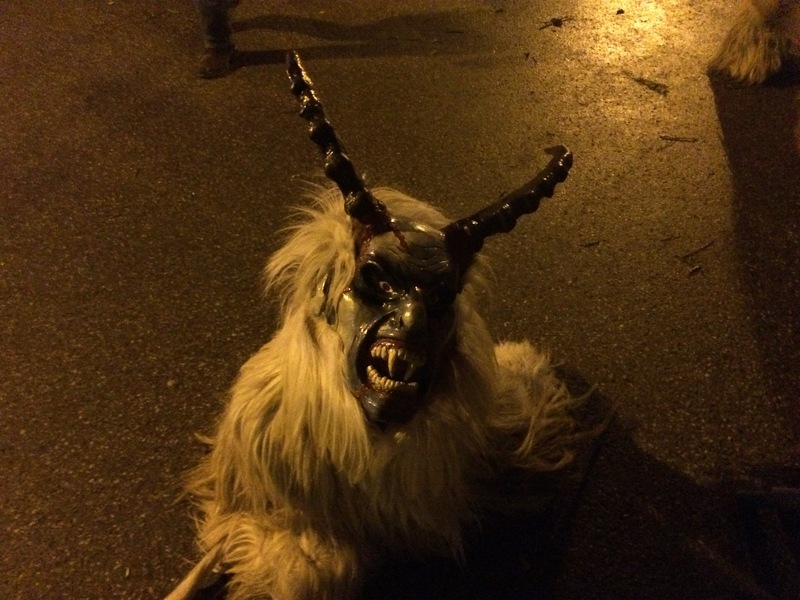 Doer and I watched, fascinated, as parents conjured Krampus to them, holding their frightened toddlers out to be inspected by the beast. While the Krampus* looked terrifying, they were mild with children, gently stroking young faces with their claws and offering handshakes and high fives (*I’m assuming the plural of Krampus is Krampus, like the word deer, but really I have no idea). 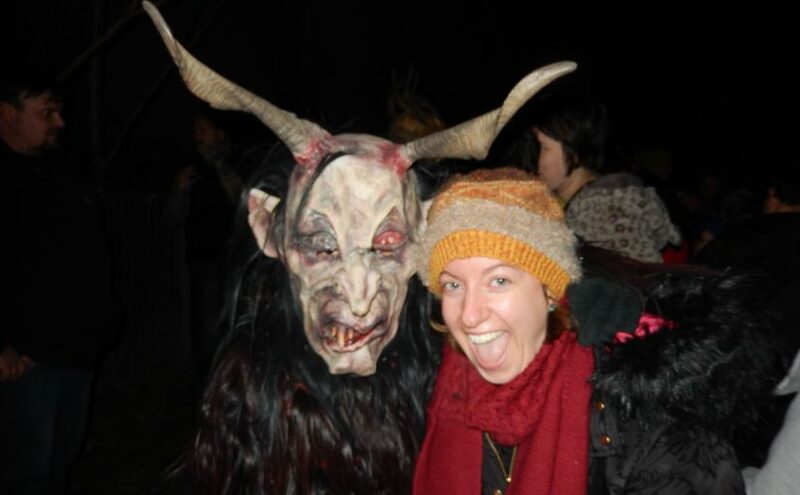 Posing with a Vienna Krampus. 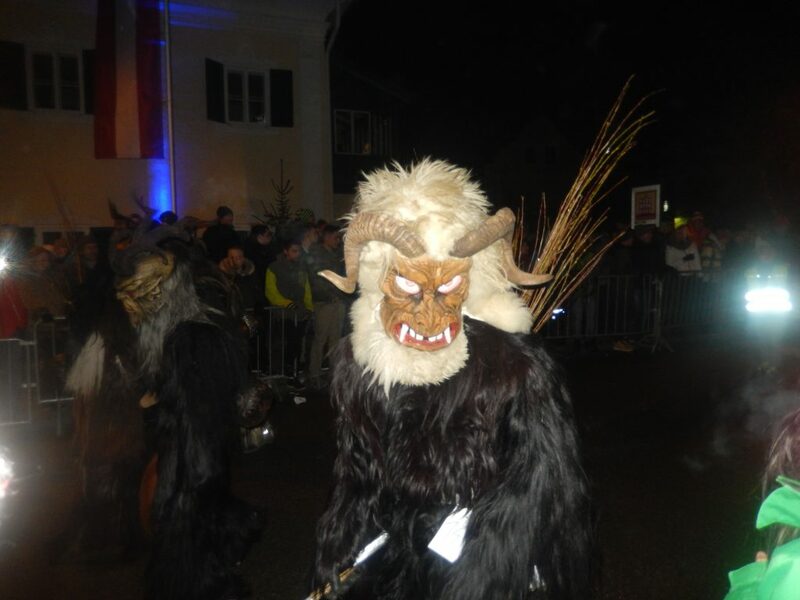 Teenage girls were a different story: as we shivered in the sub-zero night in Bad Goisern, we witnessed a number of Krampus violently plowing into the barricades to spook pretty young ladies. 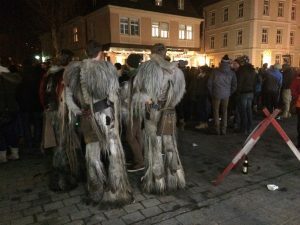 Teenage boys and young men from the community tend to don the Krampus costumes – we heard drinking alcohol is common before and after the Krampus run. 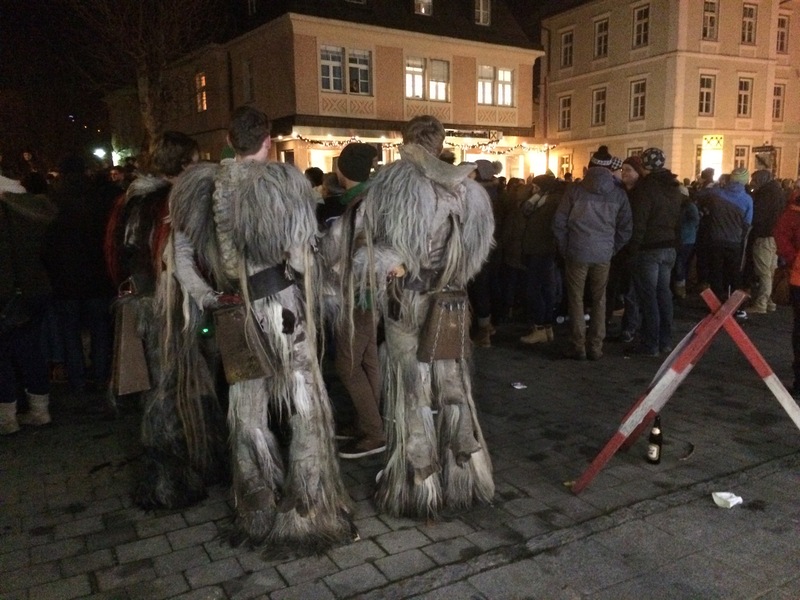 I’m guessing Krampus runs became popular in Vienna more recently, although the event we saw there can’t really be called a “run” because it was in a large circular area, and it was highly choreographed. 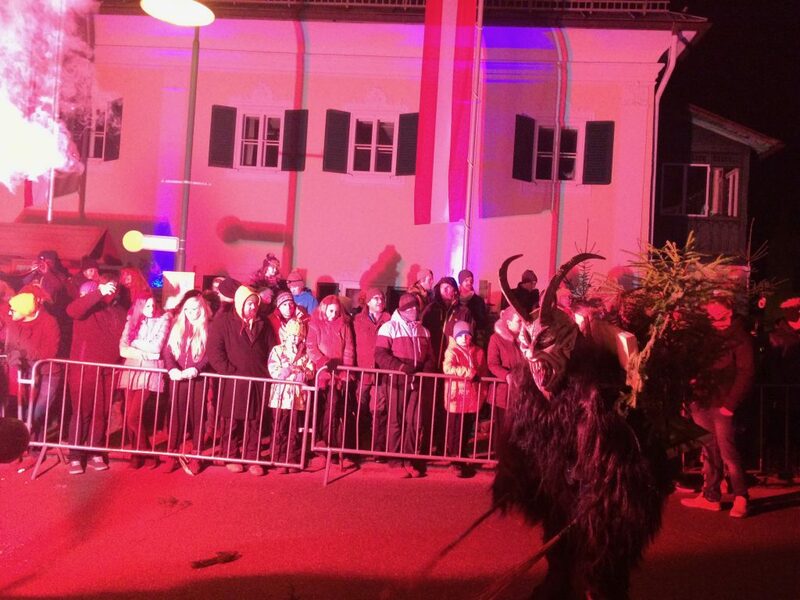 After the performance, Saint Nicholas and some of the Krampus slowly walked through a neighboring building, so onlookers could get an up-close look. 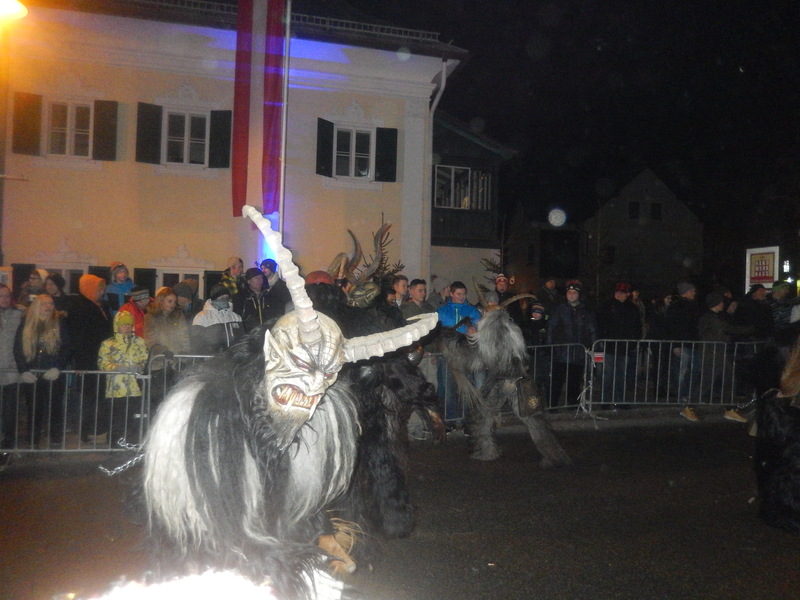 Though most Krampus are young men, children also participated in Bad Goisern. 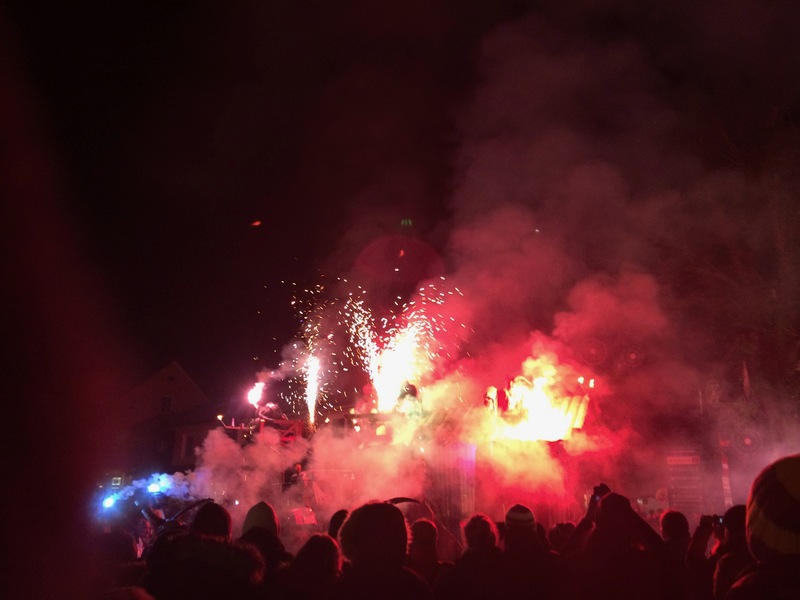 Vienna gave us a good introduction, but we both were glad we made the 3-hour drive to the event in Bad Goisern, a picturesque mountain town – it seemed to be more authentic. 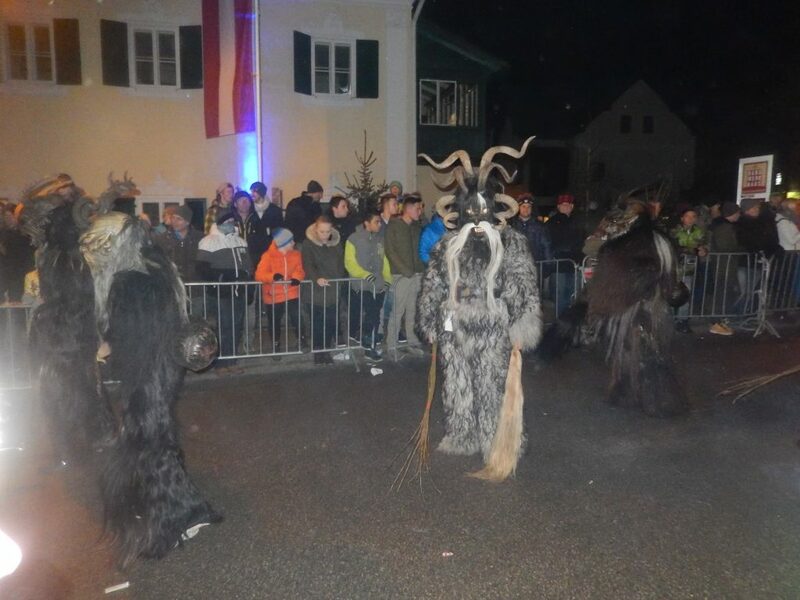 We saw a sign in the town saying there would be 1,000 Krampus, and that may very well have been true (we had to leave before it ended to make the 3-hour trip back to Vienna – our flight was the next morning). 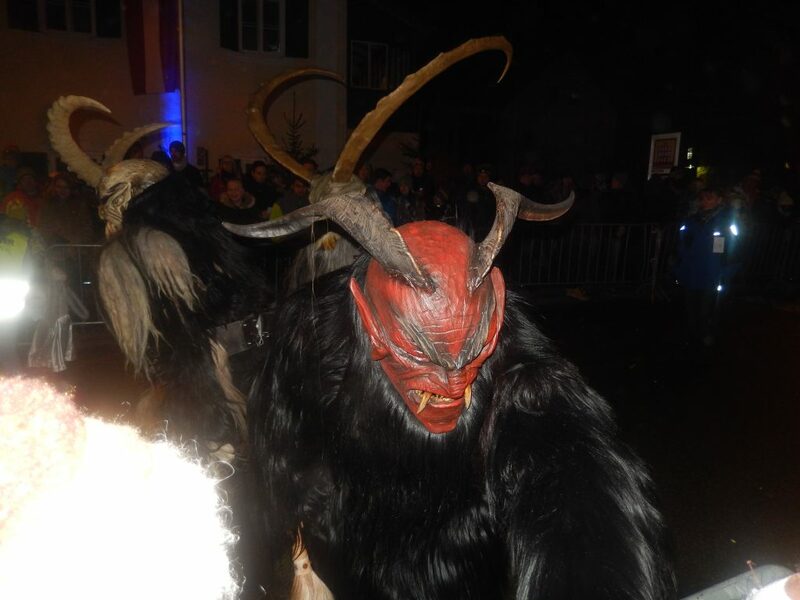 Instead of performing in an enclosed ring, the small-town Krampus stalked down a street in the heart of town, I’m estimating for about a quarter mile. 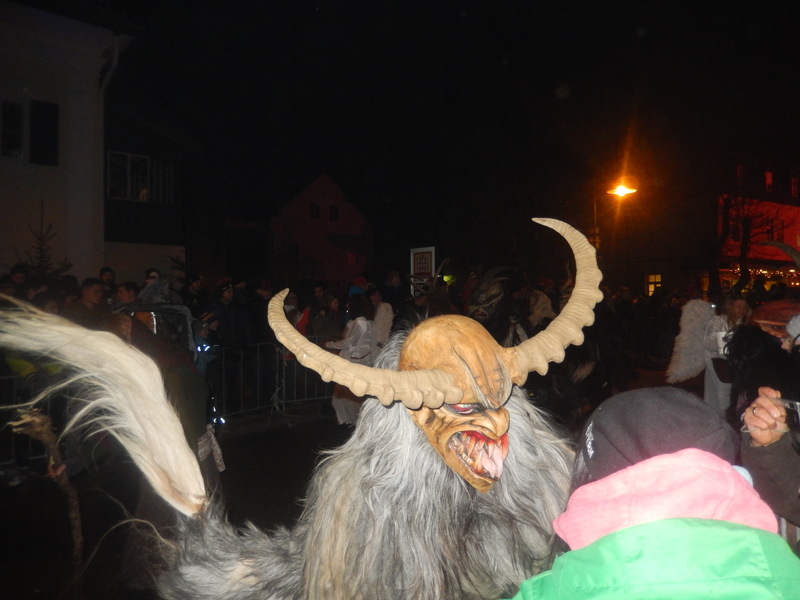 And instead of choreography, this Krampuslauf bordered on chaos. The following photos and videos offer a glimpse into that chaos. We speak very little German – I have a stable of about 25 words and phrases, including “please” and “thank you.” Luckily, it was enough to ask permission to take a photo – Krampus, foto bitte? OK, this one is from Vienna – but I love it. I recommend checking out the sources listed below if you’d like to know more about this fascinating custom. 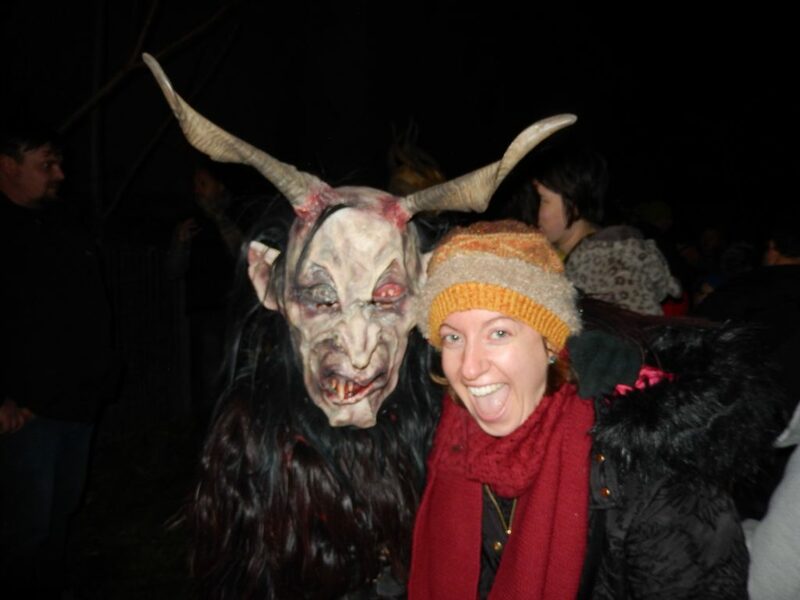 It’s where I got my Krampus facts – I’m guessing the correct word is Krampusfacten. Glad to see that’s off the bucket list? Happy New Year?